There is a new challenge starting at The House of Cards and you can read all about it if you follow the link. There will be opportunities to try out various techniques as we go along which should be great fun I'm sure. This week they are asking for a cute and fun entry to include certain colours and I've used a cute pirate image from Polkadoodles which would make a great card for a boy - I've followed the colours as closely as I could without going out to buy any more coloured card. Backing paper is from my stash (Papermania) and the dark panel was embossed using a mask and then rubbed with metallic gilding wax. Some lines were doodled around the edges for interest and a couple of buttons added in the corners. Take a look at what their design team have come up with and maybe have a go yourselves. This is so cute. What a great card for a boy's birthday. Thank you so much for joining in our very first challenge at House of Cards. Hope to see you again for the next card making style next week. You HAVE been busy. I love the card, especially the embossed panel and the doodling. 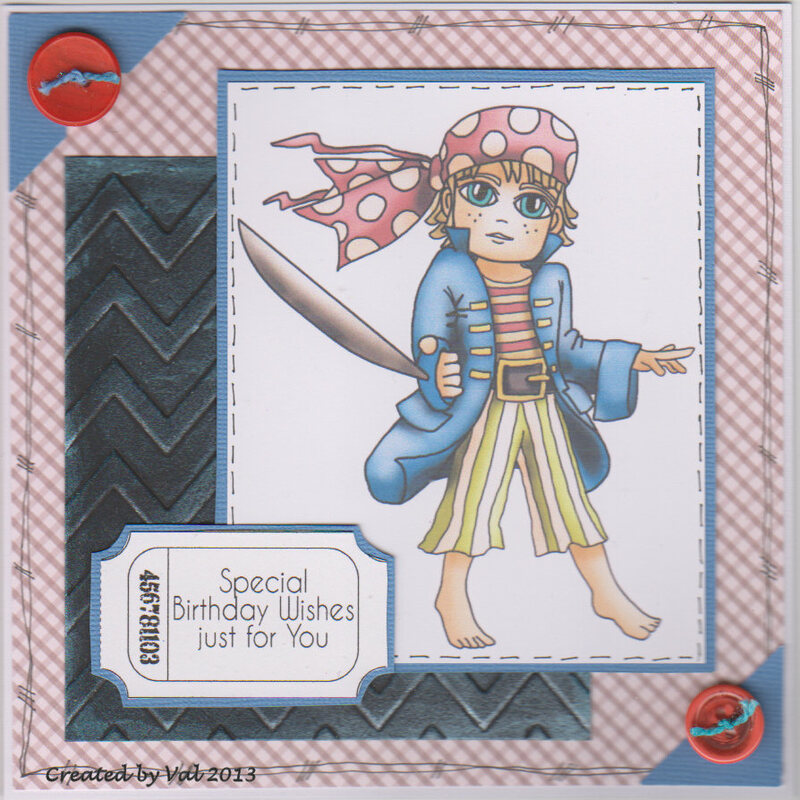 A lovely fun card for a child Val. I really like the embossed texture in the background. Hi Aquarius, what a great card you've created using our color palette! I especially love the doodled border and your beautiful shading. Thanks for joining our first ever challenge at House of Cards! Goodness you've been busy. I do like the red & blue combination - especially your buttons. Lovely shading on that jacket too. Great card Val. Love that cheeky pirate! Great vibrant colours. Such a cute entry into our Cute & Fun week at House of Cards. Thank you so much for joining us for our launch week.